Note: This game was #8 in the 2010 edition of this list. How I Remember It: I got to watch this one from the 50-yard line, about 30 rows up, behind the Florida bench. They were, at the time, the best seats I’ve ever had at an Auburn game, and it just so happened that it was for one of the best, or at least most exciting games that I have ever attended at Jordan-Hare. I remember Auburn coming into this one a week after being humiliated by Arkansas yet again. Auburn was ranked #2 before falling to the Razorbacks, and thanks to the loss, Florida moved up to the nation’s 2nd spot. The crowd was ridiculous for this one. It was if the previous week’s loss hadn’t happened. I guess it was the fact that we were playing the #2 team in the nation, or Florida, or both. The Tigers struggled in the first half, got their butts chewed at halftime, and came out and whooped the Gators in the second half. We got our first glimpse at Tim “I did everything but beat Auburn” Tebow. There was the Tray Blackmon fumble recovery (or was it an incomplete pass?) that ended a Florida scoring threat. Tre Smith did a flip after a blocked punt, and Patrick Lee returned a fumble on the last play of the game to pad the score. In many of the top 30 games, I have said that they were one of the loudest games I remember. At the time, this one was THE loudest game I remembered at Jordan-Hare. What Really Happened: As remembered, the Gators came in undefeated and ranked #2 in the nation. Auburn, with one loss, was ranked #11. Auburn’s first drive looked promising as they drove from their 9-yard line to the Gators’ 5-yard line, but the drive was stopped and the Tigers settled for a field goal. Florida answered with a field goal of their own, with the score tied 3-3 at the end of the quarter. Early in the 2nd quarter, Florida quarterback, Chris Leak, connected with Dallas Baker for a 15-yard touchdown, but Tristan Davis returned the kickoff to the Florida 38-yard line giving the Tigers a chance to tie it back up. It looked as if the Tigers would do just that, but after an 11-yard completion, Tommy Trott fumbled the ball on the Florida 3-yard line. The poor field position for the Gators resulted in a safety because of a holding call in the endzone. The score was the usual football score of 10-5. Auburn would add another field goal on their next drive to bring the score to the also customary 10-8, but Florida would extend the lead with a 16-yard touchdown run by Tim Tebow. Auburn tacked on another field goal later at the end of the quarter and the Tigers went into halftime down 17-11. The 2nd half would go much better for Auburn as they would do the only scoring for the rest of the game. The first score would come on a blocked punt returned for a touchdown on Florida’s first drive of the half. The punt was blocked by three or four Tigers and picked up by Tre Smith, who flipped into the endzone. Going into the 4th, Auburn led 18-17. 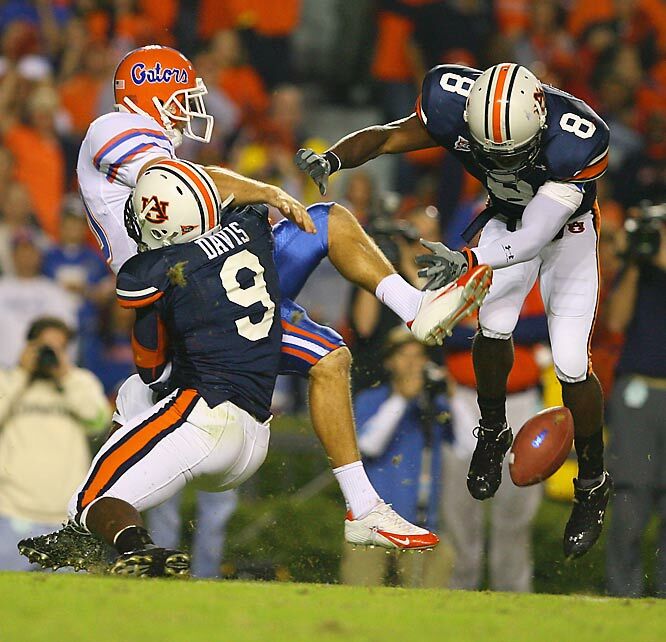 In the Gators’ first drive, they would get down to the Auburn 21-yard line, but Tray Blackmon, in all of his “see ball, get ball” glory, would cause a Chris Leak fumble. The play was reviewed, and the call was held up, much to the chagrin of Urban Meyer and Lee Corso. Leak’s arm was moving forward at the time of the fumble, but not in a throwing motion. It was more of a “oh crap, look at that guy’s arms” motion. The fumble recovery ended Florida’s only real scoring threat in the 4th quarter. Auburn added another field goal with around a minute left in the game to extend the score 21-17, In the last few seconds, after a few desperation plays, Florida ran a hook and ladder that Leak fumbled, as Patrick Lee ran it in for a touchdown with no time on the clock. Why did I pick this game? Loudest game ever (at the tie), win over #2 in the nation, who also happened to be Florida, and a dominant defensive performance in the 2nd half. I guess this one could be a little higher in the list, but I think you’ll agree with the ones above it. And I promise…no more losses. Fun Facts: This just so happened to be the only loss for Florida, who won the National Championship that year. Play of the Game: The blocked punt returned for touchdown early in the 2nd half set the tone for the rest of the game and showed that the Auburn defense was ready to play. Player of the Game: John Vaughn was 4 for 5 on field goals and scored every single offensive point (12) for the Tigers.